Sometimes, even for us, it takes a moment for these inspo blogs to come together. While it’s the highlight of our week to put these out, to be honest, sometimes it’s hard to find exactly what message feels right to share each week. These inspo posts truly come from the heart. And we feel honored that we are able to share them with you each week. But, we also need to keep it 100% genuine and are committed to only sharing a message if it’s what we are truly feeling in the moment. We are not a big corporation with some agenda trying to push certain messages across, that are predetermined by a board of directors. We are wellness professionals who are passionate about what we do and the team we are blessed to do it with each week. So when it came to write this morning’s inspo, it took some thinking. We’ve talked about not giving up, modifying, being your own motivation. So many key topics. But sometimes, when you dig too deep or get too close to something, you can miss the big picture. Technically, no one misses a Monday. That’s how days and weeks work. You hope not to miss a Monday in life, because that wouldn’t be a great alternative. Good, bad, or ugly – you get 52 Monday’s a year to face. For some reason, Monday is the day many look LEAST forward to. I guess it makes sense. Most have just enjoyed a weekend with less structure, more friends/family, hopefully a little extra shut eye and a little less routine. So when we hear the word “Monday”, we think going back to a life of structure, of “have to’s” and we tend to get down and the dumps. Not around here in the world of VFit! We take our Monday’s seriously and see this day as the BEST opportunity to set a positive tone for the week. To set goals and shift our mindset to one of growth – where change is possible, where you can truly accomplish more than ever expected with some accountability, planning, and support. When you accomplish something mentally and physically challenging, like a good workout at the start of your week, you start the positive snowball effect of being productive and happy the REST of your week! So your commitment on Monday not only gets rid of the Monday blues, it also sets you up to be more successful at everything else the rest of the week! We like getting a good return on our investments and showing up to workout for 30 minutes on a Monday is one good bang for your buck! Showing up to a workout is like hooking yourself up to an IV of happy juice! Monday is the day you may need that the most. 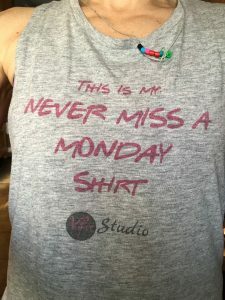 We are so passionate about this saying, we have a shirt made with this hashtag and so many of our teammates take our their #NEVERMISSAMONDAY shirt’s on Sunday night, and get ready to live up to these great words. Our #NEVERMISSAMONDAY schedule is jam packed each week with 12 live group fitness classes each and every week. That’s 12 times our teammates are able to log in and join their favorite VFit instructor and teammates work through incredible challenges together. Our classes are designed to fit exactly into 30 minutes (15 if you count our work week EXPRESS series), from start to finish. Our world class trainers design each class to focus on form, function, planes of motion, mobility, balance, cardio, and strength. Our trainers push and challenge you, physically and mentally. And we expect you! You sign up for your class in advance and you are greeted by name with a big ol’ smile from your live instructor. Our teammates are spread across the country and wake up on Mondays pumped to log in to their live #NEVERMISSAMONDAY VFit class. They finish class feeling energized, motivated, and excited to kick off the rest of their day. Or if it’s our final class of the night, Yin and Unwind Yoga, they are taking 30 minutes of inward reflection and meditation along with deep stretches to cap off their day. If you wake up each Monday with dread, you can stop that thinking dead in its tracks and choose to embrace a #NEVERMISSAMONDAY attitude too. It’s as easy as that, make that choice, find a team that supports you, and go for it. If any of YOU are ready to set a new tone for your day, week, month, and year, let us work with you and embrace the #NEVERMISSAMONDAY mindset together. If you are looking to be surrounded by a positive and inspirational group of teammates and trainers that will change the way you approach life, the VFit team has a spot for you! Don’t go at your health and fitness alone.